The Audi R8 LMS GT3 racecar won the 24 Hours Nürburgring on its debut last year and laid the foundation for a successful motor racing season for Audi Sport. To celebrate that the R8 LMS special edition called Selection 24h has been unveiled as a tribute to the 323 races winning tally of in national and international series for the last seven years – including overall wins in 24 hour races on the Nürburgring, Spa-Francorchamps, Zolder, a class victory in Daytona and Dubai. 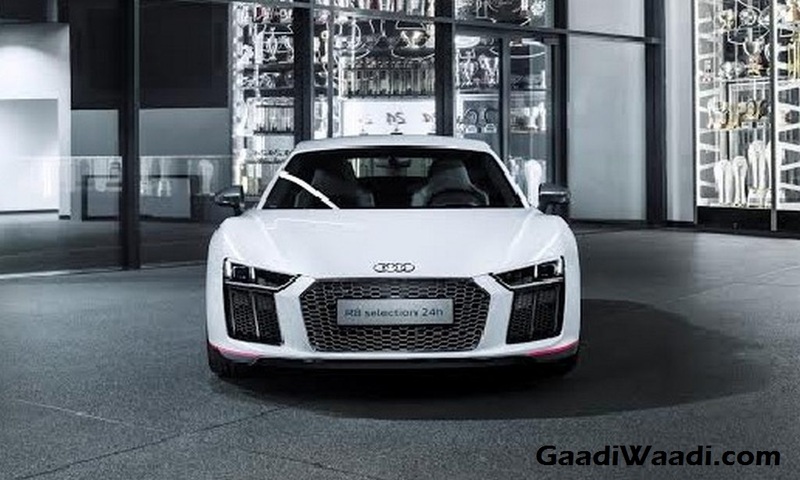 The Selection 24h will have a limited production run of 24 examples and is based on the Audi R8 Coupé V10 plus that gets powered by the 5.2-litre mid-engined V10 generating 610 hp and can accelerate from 0 to 100 kmph in just 3.2 seconds before topping out 330 kmph (205.1 mph) – making the Audi R8 Coupé V10 plus the fastest and most powerful production Audi ever. A new quattro all wheel drive system distributes power while the suspension and aerodynamics are configured to handle high downforce. It features motorsport-inspired Audi virtual cockpit as Audi developed the second-gen R8 in conjunction with the R8 LMS GT3. 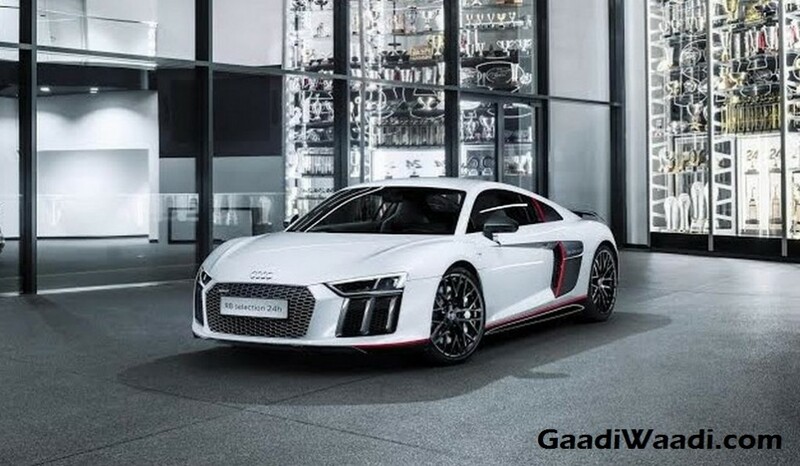 The Audi R8 Coupé V10 plus has dry weight of 1,454 kilograms and is built using multimaterial construction principle. The aluminium and carbon fibre-reinforced polymers (CFRP) combination in the Audi Space Frame with the technical package in the Selection 24h aided for admiring handling. 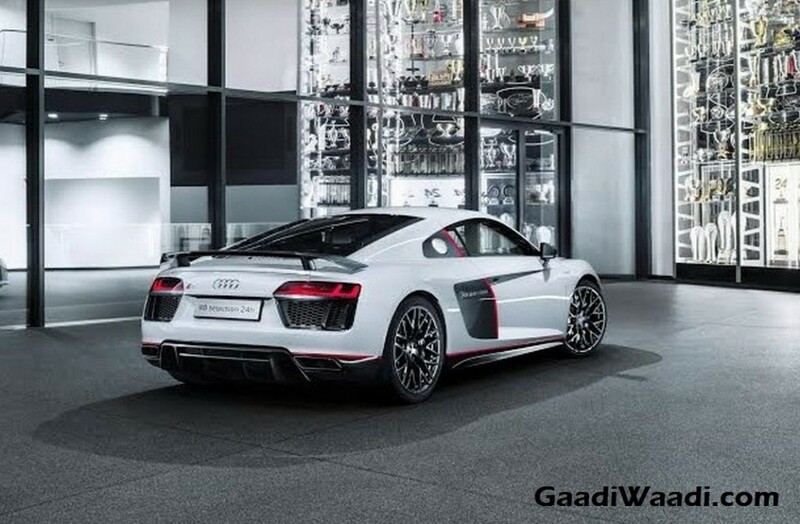 It comprises of dynamic steering, adaptive damper control system and Audi laser lighting. The tri-colour paint job has Suzuka gray as the basic colour besides mythos black and Misano red highlights. The mirror housings, front spoiler, engine compartment cover, the rear wing and the diffuser are made from gloss-finish carbon fibre. 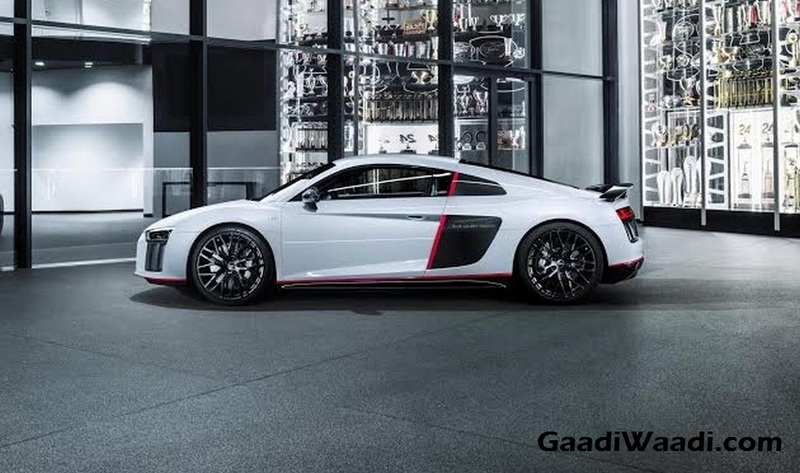 The side-blades with matt-finish R8 24h logo, black-trimmed tailpipes, 20-inch forged aluminium wheels in 10-spoke Y design are painted gloss anthracite black. On the inside, full-leather upholstery and trim in rotor gray with Alcantara headlining, air vents and the extended inlays, illuminated door sill trims are also made of gloss-finish carbon. The entry lights on the doors project the Audi R8 logo onto the road surface. In the Le Mans 24 Hours, Audi celebrated 13 overall wins in the past 15 years. The first five of these were clinched by the R8 sports prototype which gave its name to the production sports model. The GT3 racing car Audi R8 LMS made its competition debut in 2009. It has since collected over 300 wins worldwide, including overall wins in 24-hour races on the Nürburgring, at Spa-Francorchamps and Zolder, and in Dubai. It also has a class victory in Daytona to its name. Last year, the new generation of the Audi R8 LMS made a dream debut and won its first 24-hour race on the Nürburgring at the very first attempt. The Audi R8 Selection 24h will be displayed to the public for the first time at the AUDI AG presentation during the 24 Hours Nürburgring race. Orders have been placed from May 10, 2016. and they cost EUR 229,000 (Rs. 1.73 crore) in Germany.